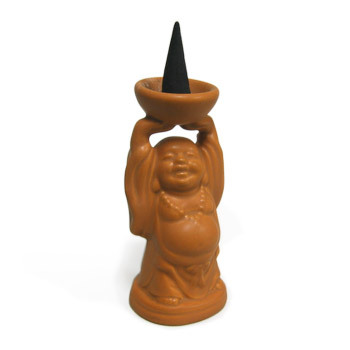 Hands raised above his head, Abundance Buddha holds a ru-yi pot (bowl of plenty) to receive your incense and prayers. This jovial figure of Buddha represents the later Buddhist notions that a good life is indeed attainable in this world, consisting of self-mastery, a happy demeanor, purposeful endeavor, a deep commitment to the welfare of others and enlightened awareness. Measures: 1.75" x 2.75"W x 3.75"H. Comes with 12 incense cones. Rub his tummy each day and make a wish for yourself and others.